Thirty years ago, I was miserable in my job. I was with a big global firm, and had invented a future concept that wouldn’t arrive until some 10 years later. No one understood what I was talking about, believed in the future that I saw, or fully pledged support. I bailed out, with the support of my wonderful wife, and started my own consulting firm. I ended up writing a few books, and my career suddenly exploded and morphed into something new and unforeseen. Today, I travel the world sharing my thoughts on what comes next with leaders, innovators and dreamers. I remember fully the mindset that possessed me when I was mired in my misery, I questioned my skill set. “Who might possibly hire me?” “What skills do I actually have?” “I’m stuck in a rut and I can’t get out!” It was a pretty challenging time – but I’ve come to learn that many people get stuck in a similar rut. When things look bleak, it’s all too easy to convince yourself of your limitations, and to listen to those who are willing to “cut you down to size.” But during these times of challenge, you should look deep inside yourself for your potential. It’s there – it’s just been smothered, buried, boxed away by the constant bombardment of the naysayers who would limit your future! What a dangerous state of affairs we place ourselves in, when we don’t believe in our abilities! 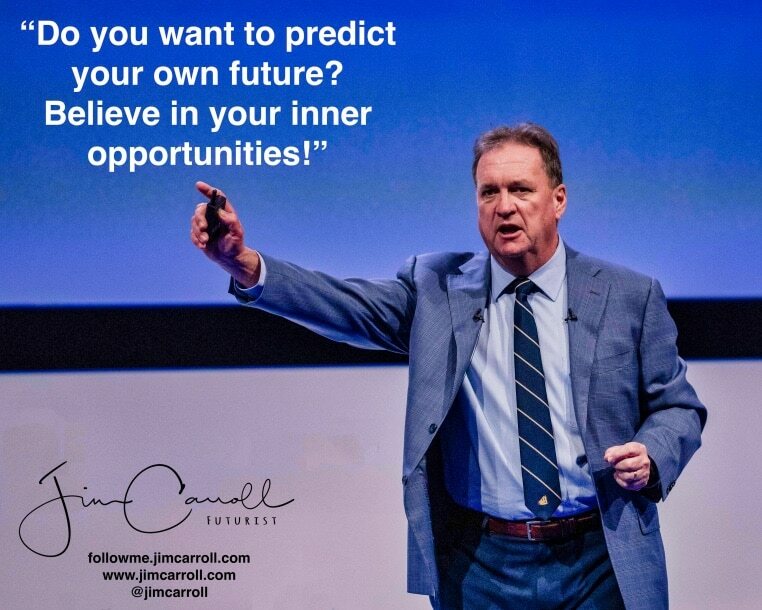 When we listen to those who dare to predict where our future might take us – and immediately lower our potential! When we convince ourselves that there isn’t much of a future out there. But it’s there – and it’s inside you. You just need too focus on listening to it, letting it out, nurturing and shaping it so that it can be fully unleashed. The future is in there, inside you! Start to set it free today!